1. Preheat oven to 350 degrees F. Butter a 9x13 inch baking dish. 2. Prepare the fruit base: In a large mixing bowl, combine apple, pears and lemon juice; toss to coat. In a medium bowl mix granulated sugar, brown sugar, flour and cinnamon. Sprinkle sugar mixture over apples and pears tossing to coat. Pour apple pear mixture into prepared pan, spread into an even layer. 3. Prepare the topping: In a large bowl, combine the oats, flour, cinnamon, and brown sugar. Mix butter and vanilla together and pour over oat mixture; stir to combine. Crumble mixture evenly over the apples and pears. 4. Bake in preheated oven for 40-45 minutes or until the crumble topping it golden brown. Serve warm. 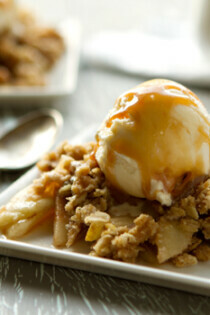 If desired, top with vanilla ice cream, caramel sauce, or whipped cream.